Princess Alexandra returned to a hospital in Worcestershire which was named after her to officially open its new orthopaedic centre. 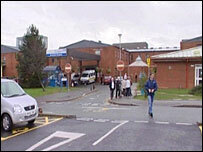 She went to the Alexandra Hospital in Redditch 20 years after she opened the hospital itself. The princess went to the site on Tuesday where she met with staff and patients. The orthopaedic centre, which was built at a cost of £2m, opened its doors to patients in January this year.